Adorable and charming 3BR, 2BA home in Pewee Valley. 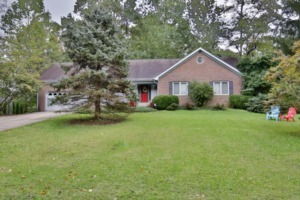 This home sits on a partially wooded, .48 acre lot on a quiet street. From the quaint front porch, you enter into the foyer with custom built-ins. The cozy living room leads into the beautifully updated eat-in kitchen with gorgeous granite countertops, white cabinets & stainless steel appliances. The spacious, vaulted sunroom has both heat & air conditioning & includes a stone fireplace & attractive wood floors. Two guest bedrooms share a full guest bathroom with tile flooring. The master bedroom with trey ceiling has a walk-in closet & attached master bathroom with a nice sitting area & tile flooring. Award Winning Oldham County Schools & a fantastic location just minutes from shopping, dining & the interstate. Click to schedule your showing.